When you go on holiday, what are the main things you look for in your accommodation ... Luxury? Views? Delicious food and drink? Standout decor? Great service? Hip location? 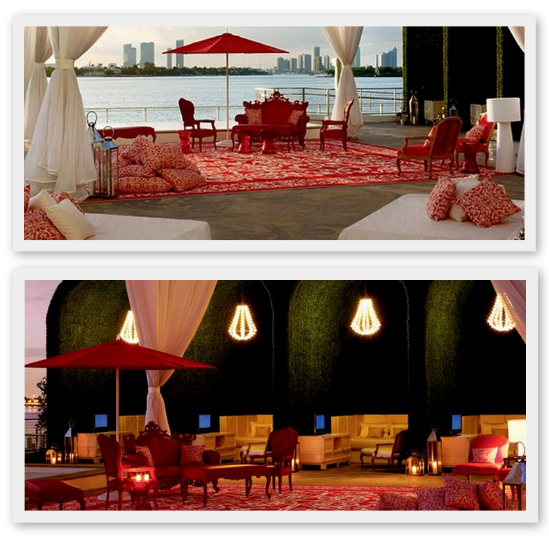 If you look for all of these things then The Mondrian Miami South Beach Hotel is the hotel for you! Part of The Morgans Hotel Group, this Miami base is just as luxurious as its sister hotels which include London's Sanderson and St.Martin's Lane and The Delano also in Miami. Myself and mini mouse recently spent a week in this jaw dropping hotel. The Dutch designer, Marcel Wanders responsible for this masterpiece actually nicknamed the marvel 'Sleeping Beauty's Castle' and that it certainly is. The extraordinary interior boasts stark white chess-like columns, a floating ebony laser-cut lace staircase, big gold bell hanging lights, Jamie Hayon's ice-white thrones fit for a king ... need I go on! The exterior features secluded cabanas for secret rendezvous, a pool bar shaded by an 11-foot lamp shade complete with petticoat trim and water coolers placed at each corner of the pool laden with fresh strawberries, orange, lemon and lime to give the water a fruity tang. Lush! Now if what i'm about to tell you doesn't impress you enough to make you visit this slice of Alice in Wonderland heaven then nothing will ... The weird and amazingly inspired David LaChapelle hosted a party back in 2008 during the hotels opening week, which officially makes this THE coolest hotel EVER! The 200 million dollar hotel opened in 2008 and boasts 335 guest rooms. We stayed in one of the suites featuring a spacious lounge, kitchenette, balcony, bathroom and bedroom home to two doubles. The hotel room comes complete with fairy-tale inspired accents like a mosaic-tiled shower with a crystal chandalier showerhead *WOW*, bold eye-catching flock rugs and wallpaper and a bronze-effect mirror guaranteed to make you feel a million dollars. Each hotel room also features its very own live-in sunshine state doll in the form of a wall sticker. Our Miami babe rocked a riding hat and had the most beautiful long lashes and plump cherry lips! We were glad she lived in the lounge area because she had those kind of eyes that followed you everywhere ... apparently she lives in some of the standard room bedrooms and watches over you whilst you sleep - creepy! One downside to report is that there is only one full-length mirror and it's located in the shower! This therefore means that if you want a head-to-toe outfit preview you will have to step into the wet room, rub a you-shape area so it's steam free and try not to get dripped on!!! Now mini mouse is currently working on a Miami restaurant guide so I won't go into detail about the food but I do have to mention that the hotel has its very own Asia de Cuba restaurant. We sampled both bar food and the $50 Sunday brunch and were blown away by both ... more to come on that soon! If you're thinking this hotel couldn't get any cooler then you would be mistaken! It also has a BASE 24/7 luxury vending machine for guests. Featuring four must-own designers including Miansai handcrafted jewellery, cool kid Nixon watches, colour-popping Urbanears headphones and Flight 001 travel accessories. The hotel is based on West Avenue, a perfect central location within walking distance of must-visit areas including shopping mecca Lincoln Road, Barely there Bikini clad Ocean Drive and food haven Wholefoods. Everything you need is just a stone throw away and I would go back in a heartbeat!